Canadian author Rene Chartrand begins by covering the situation on Lake Ontario when Fort Oswego was originally built by the English to trade with the Indians. But the French did not intend to let the British establish themselves there and built other trading posts/forts in the vicinity, like Fort Toronto. When the Seven Years’ War broke out, Mr. Chartrand covers the reinforcements from Europe that were sent to North America. He then illustrates the situation in 1756, where Fort Oswego threatened to be the focal point for an Anglo-American drive deep into Canada. But Oswego had a weakness: all its supplies had to come from distant Albany. In March 1756, the French and Indians struck at one of the posts in Oswego’s supply chain, Fort Bull. The defenders and their gate held off the French for a while, but the French broke in and began destroying British supplies. Then flames began to spread through Fort Bull, igniting the powder magazine in an explosion. When General Montcalm arrived in Canada, he and Governor Vaudreuil quickly decided to strike against Fort Oswego. 3,000 French and Indian soldiers were ferried across Lake Ontario to attack the British fort. More incredibly, the voyageurs transported 20 cannons. The French built batteries to bombard Fort Oswego, and the artillery duels are chronicled here as well. The British artillerymen put up a gallant defense, but were forced to surrender on August 14, 1756. This was Montcalm’s first victory in the French & Indian War. In addition to his engaging text, Mr. Chartrand also includes sidebars with interesting historical facts. One provides an order of battle for Montcalm’s Oswego expedition, while another lists the British prisoners, cannons, and flags captured. Interestingly, the information on Oswego’s flags also clears up a small mystery I chronicled on my blog http://www.defendingthelegacy.blogspot.com/2013/10/the-mystery-of-oswegos-three-flags.html. 5 flags were captured by Montcalm: 2 of Shirley’s 50th, 2 of Pepperell’s 51st and 1 of the New Jersey “Jersey Blues”. Those from the 50th and 51st were hung up in Quebec’s Cathedral and were later recovered by General Amherst in 1760. But the flag of the Jersey Blues was not. Instead (according to a letter written by General Montcalm’s wife), it was sent home to Montcalm’s family as a trophy of victory. Mr. Chartrand seamlessly weaves together French and British sources to create his narrative, while paying tribute to the bravery of the soldiers on all sides. His information and writing is excellently done. Nor does he stop at the end of 1756, providing additional information on the main characters later on, as well as the development and current state of the Fort Oswego area. The book is finished with a long list of sources for further reading. Maps are an important part of conveying the story of history, and again this book excels. The maps are plentiful and appear at their parts in the narrative. One of the most interesting (to me) was a map tracing the route of the French and Indians as they went to raid Fort Bull where every night’s campsite is marked. Other maps show the French lines during the siege and the supply route from Fort Oswego to Albany, NY. My photograph of Montcalm & his men inspecting Fort Oswego. 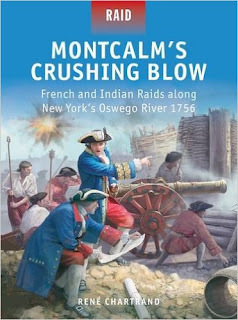 Osprey’s books are known for their carefully reconstructed original artwork and Montcalm’s Crushing Blow is no exception. The cover is an animated study of General Montcalm and Engineer Desandroins attending a battery bombarding Fort Oswego. Inside, there are 4 paintings by the excellent painter Peter Dennis, divided into two uniform studies and two battle scenes. Mr. Dennis’s paintings have an excellent balance between accurate detail and compelling action. The first painting is a uniform study of an officer and enlisted man of the New Jersey “Jersey Blues” Provincial Regiment with almost a whole page of descriptive text. The next one is of an officer and enlisted man of the French Canadian militia, again with a page of text. The first battle scene shows the Canadian militia storming Fort Bull’s main gate. Some of them are firing through the loopholes into the fort, while a party of Canadians under an officer use a log to batter in the gate, a detail expressly noted in the account of a French officer, Chevalier de la Pause. The second battle scene depicts the Royal Artillery defending Fort Oswego from the French cannons. Lieutenant-Colonel Mercer is inspecting the defenses as a French cannonball flies through the air. One second later, Mercer would die when he was hit by the cannonball. This plate even shows the pork barrel casks that were used to create a new defensive wall. While Osprey’s books are known for their original artwork, they also contain other illustrations as well. In this area again, Montcalm’s Crushing Blow does not disappoint. This book is filled with uniforms worn by the soldiers, original French and British maps of the area, and portraits of the main characters like the Marquis de Montcalm and Colonel Peter Schuyler. Every illustration is captioned, giving extra information on the dimensions of bateaux or Montcalm’s Irish soldiers. If you have any interest in the French & Indian War or Early America, this book is highly recommended. Rene Chartrand’s detailed yet easy-to-read text is well matched with Peter Dennis’s lively and detailed artwork. My overall rating is 5/5 stars.